Botox and Dermal Fillers is the only approved temporary treatment. What is Botox® and Juvederm® and how do they work? Juvedermc is a next-generation non-animal dermal filler that is made from hyaluronic acid – a naturally occurring substance that play a vital role in hydrating your skin and replenishing its natural volume. It offers a safe nonsurgical option for smoothing facial wrinkles and folds. 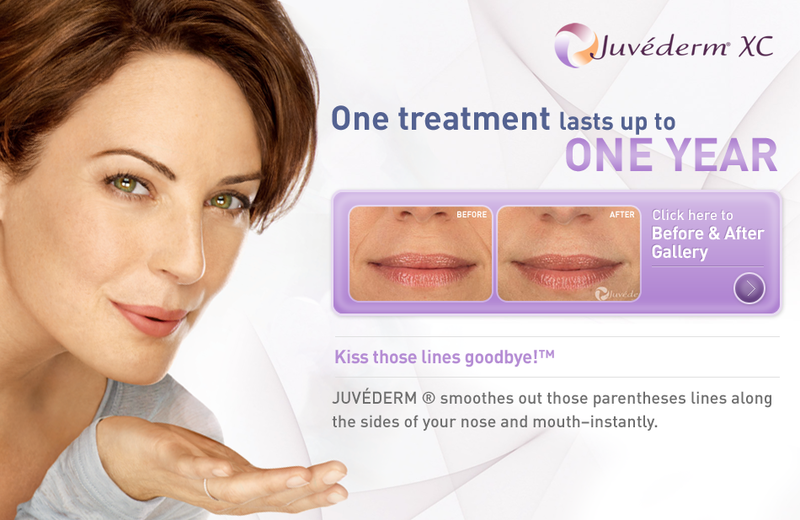 Juvederm® reduces the appearance of fine lines and wrinkles around the nose and mouth as well as vertical lip lines and marionette lines. Noticeable improvement can be seen immediately following your treatment and has been proven to last up to 9 months to 1 year. Prices are per syringe and is determined during consultation.